On Hindi Diwas, activists target kilometre stones on National Highways in state. 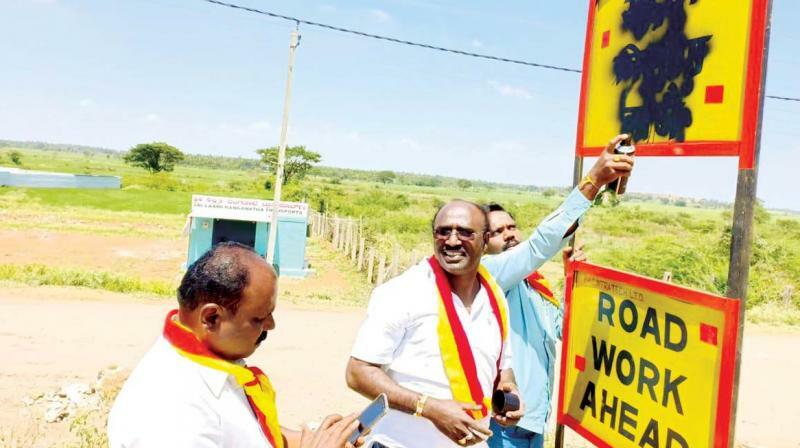 Bengaluru: While the Central government was celebrating Hindi Diwas on Friday, the Karnataka Rakshana Vedike (KRV) activists took to National Highways and blackened the Hindi text written in signboards and kilometre stones in several parts of the state. According to KRV president T.A. Narayana Gowda, this was in protest against the alleged imposition of Hindi language on non-Hindi speaking people in the country. The activists blacked the signboards and kilometer stones in Bengaluru, Davangere, Shivamogga and other districts. The activists called for equal treatment of all the languages spoken in the country and protested the government’s move to declare Hindi as national language and then impose it on all the states in the country. “India is a multilingual country with people speaking hundreds of languages. Making Hindi as the official language of Union government is unacceptable and is disrespectful to other languages. If the government wants to celebrate only Hindi Diwas, we condemn the move,” Gowda said. The KRV leader said he would carry on the protest against the imposition of Hindi, until other languages are given equal importance. It may be recalled that in June and July last year, the Kannada activists had blackened Hindi signboards in metro stations in the city.